The politics of oil and ecology have put President Obama between a rock and hard place, as he faces a decision on whether or not to permit construction of a new pipeline. 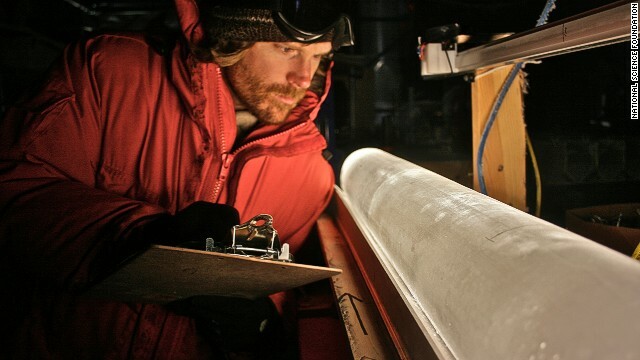 The squeeze just got tighter with a new, negative environmental assessment. The Keystone XL pipeline will give America energy independence, thousands of jobs, important industrial infrastructure and won't cost taxpayers a dime, say proponents. Many of them are Republican lawmakers. It is dangerous, inherently filthy and must be stopped, say opponents, some of whom are Democrats who helped get the president elected. Global warming has propelled Earth's climate from one of its coldest decades since the last ice age to one of its hottest - in just one century. Things are set to get much worse in the future. They can reach lengths of 18 feet and their numbers are estimated to be in the tens of thousands, but Burmese pythons, a nuisance in the Everglades, aren't easy to find. "It's an amazing challenge to try to come out and hunt these big snakes," hunter Dennis Jordan told CNN Miami affiliate WSVN in the closing days of the 2013 Python Challenge sponsored by state officials. The Florida Fish and Wildlife Conservation Commission announced Saturday that 68 Burmese pythons were taken during the January 12-February 10 competition that drew 1,600 registrants lured by prizes of up to $1,500. Though the take was small, wildlife officials said their main aim was heightening public awareness of the invasive species. A tank storing radioactive waste at the Hanford Nuclear Reservation in southeast Washington is leaking liquids to the tune of 150-300 gallons per year, the governor said Friday. "This is an extremely toxic substance and we have to have a zero tolerance policy for leaks of radioactive material into the ground, and potentially groundwater of the state of Washington," Gov. Jay Inslee told reporters. He stressed the leak poses no immediate public heath risk, but said that fact should not be an excuse for complacence. The pteropod (marine snail) inhabit the top 200 m of oceanic waters. Their shells are made of aragonite that can dissolve rapidly. Until recently, the main threat to the lives of sea butterflies, tiny snails with winglike lobes that float in ocean currents, had been the fish and birds that rely on them as an important source of food. 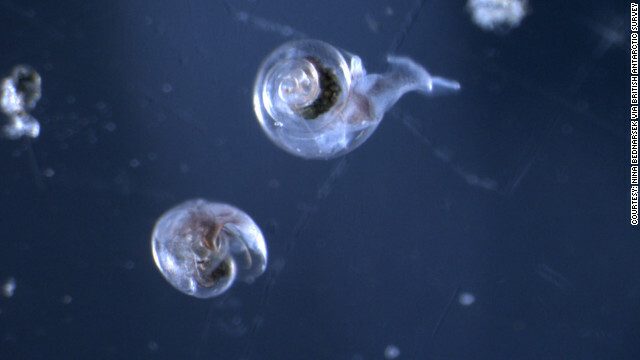 But a new, less visible menace is emerging, scientists say, as the parts of the ocean that the snails inhabit become more acidic as a result of the burning of fossil fuels by humans. In a study published this month, a group of international scientists say they have discovered that the snails' shells are being severely eaten away by the rising acidity in an area of the Southern Ocean near Antarctica. This is the first evidence of the changing chemistry of the oceans affecting living organisms in their natural environment, according to the scientists, whose paper was published Sunday in the journal Nature Geoscience. Ten beached pilot whales were rescued Sunday in Scotland, but 16 others could not be saved, the local newspaper The Scotsman reported. The stranding occurred between Pittenweem and Anstruther at the mouth of the bay called the Firth of Forth on the North Sea. Rescuers took advantage of high tide to get 10 whales out of trouble about 4:30 p.m., but the rest, including three calves, died, the paper said. A 17th whale died Monday, BBC reported. The Fife Coastguard, Fire Brigade, British Divers Marine Life Rescue team, and Scottish Society for Prevention of Cruelty to Animals were joined by local veterinarians and volunteers in the rescue effort, The Scotsman reported. 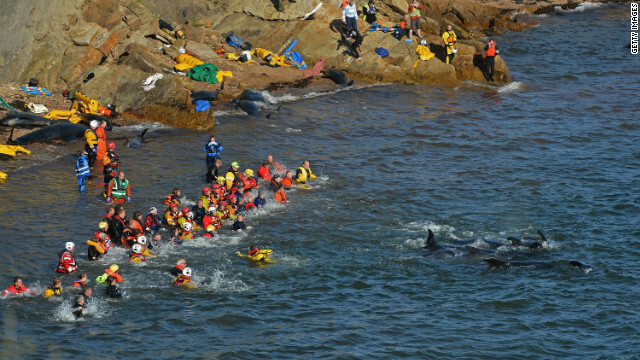 Large crowds gathered but were urged not to interfere with the rescuers. A group of whales believed to be the ones that were refloated was spotted Monday near North Queensferry, across the Firth of Forth from the Scottish capital, Edinburgh, BBC reported. 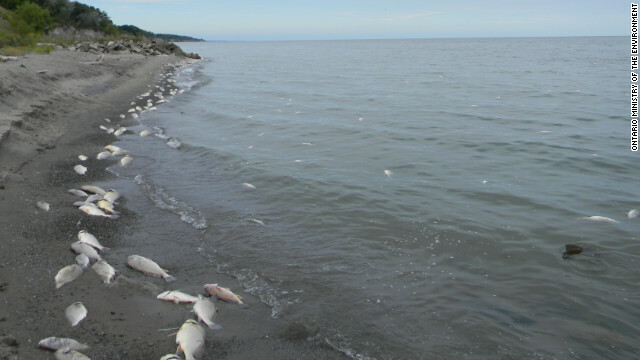 They were being monitored for signs of stranding as low tide approached. About two dozen other whales, believed to be from the same pod, were seen in shallow water a short distance away. Bob McLellan, Fife Council's head of transport and environmental services, told BBC the whale carcasses are in a hard-to-reach place and may have to be winched up the cliff face for disposal. 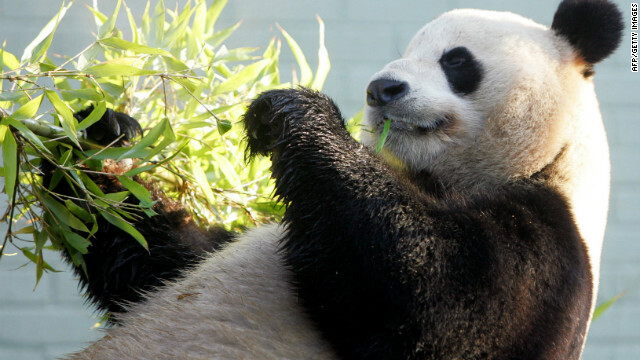 Is Greenpeace's prank on Shell oil a 'scam'? (CNN) - If there's an official ranking for snarkiness, Greenpeace and the Yes Lab have got to be near the top this summer. Their snarky social media mash-up takes Greenpeace's campaign against Shell Arctic drilling to a whole new level. It's a fake Shell website that encourages supporters to create ads that mock Shell's offshore drilling effort and to sign an anti-drilling petition. Greenpeace teamed up with Yes Lab in June to create the fake website. No matter which side you favor regarding offshore Alaska oil drilling, watching this fight is just plain fascinating. Just make sure you get out of the way when the fur starts flying. The Greenpeace/Yes Lab social media campaign clearly points to a strategy to succeed in a cacophonous Internet where it's increasingly harder to be heard and credibility is often called into question. Although Shell is none too happy, calling the campaign a "scam," Greenpeace says it has received no legal action from Shell nor threats of legal action. South Korea is considering hunting whales in the waters off its shores for scientific purposes, drawing condemnation from environmental groups. Citing calls from fishermen for a resumption of limited whaling, the head of the South Korean delegation to the International Whaling Commission, Kang Joon-suk, said Wednesday that Seoul was working on a proposal to hunt minke whales migrating off the Korean Peninsula. Korean fishermen complain that the whales are disrupting their fishing activities and eating fish stocks, Kang said at the commission's annual meeting in Panama. Nonlethal measures are not enough to assess the whales' numbers and feeding habits, he said. 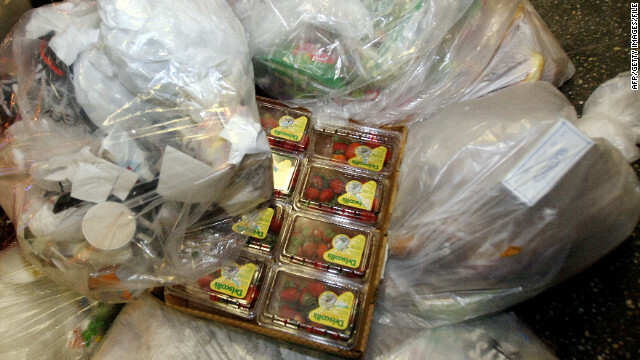 But environmental organizations are skeptical about the South Korean explanation. "We believe this move is a thinly veiled attempt by Korea to conduct commercial whaling under the guise of scientific research, similar to hunts conducted by Japan in the Southern Ocean whale sanctuary," said Wendy Elliott, head of WWF's delegation to the whaling commission. 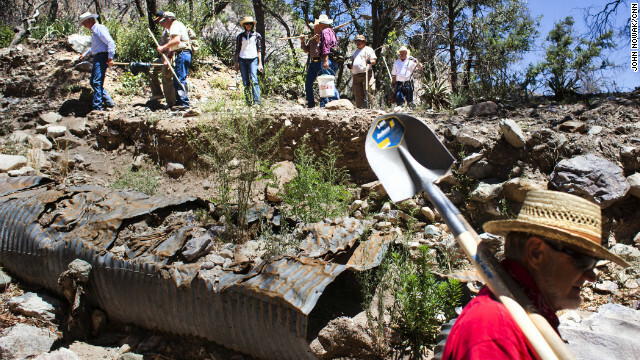 Members of the Tombstone Shovel Brigade climbed two miles up a steep canyon to repair a 26-mile water pipeline. Tombstone, Arizona (CNN) – Under an unforgiving desert sun, about 60 determined souls gathered in a high school football field under the banner of the Tombstone Shovel Brigade. They collected shovels and joined a pickup truck caravan across the desert. Then they climbed two miles up a steep, rocky canyon and began to move part of a mountain, one boulder at a time. Thousands of miles away, in the nation’s capital, Tombstone’s congressman and the city archivist tried to move a bureaucratic mountain, too, during hearings before a subcommittee of the House Natural Resources Committee. Tombstone, as CNN has reported, is in the midst of a court battle with the U.S. Forest Service. At issue is whether Tombstone can take heavy equipment into federally protected wilderness. Tombstone is trying to repair a 26-mile pipeline that has brought mountain spring water into the city since 1881. 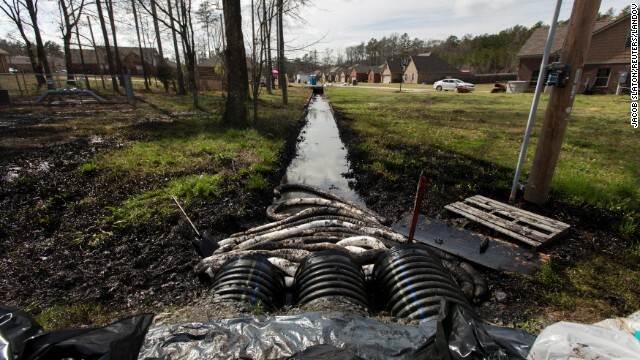 The pipeline was damaged during last summer’s Monument Fire and floods that brought mud and boulders crashing down the denuded mountainside. The city sued the Forest Service in December, accusing the agency of dragging its feet during a state of emergency. 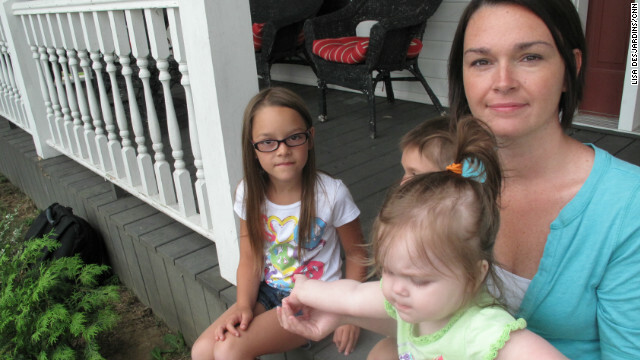 The courts have turned down the city’s request for an emergency injunction, and so the battle has entered a new phase in the court of public opinion. Frustrated with the slow pace of the repairs, Tombstone’s supporters created the nonprofit Tombstone Shovel Brigade a couple of months ago. They are helped by the organizers of the Jarbidge Shovel Brigade, which used volunteer muscle power to move a boulder and reopen a mountain road on federal wilderness in 2000. Tombstone has become the poster city for a sweeping resurgence of the Sagebrush Rebellion in some Western states. This time, Utah state Rep. Ken Ivory explained, the rebellion is not fueled by oilmen and cattle ranchers. U.S. Rep. Jeff Flake has introduced H.R. 5971, the Emergency Water Supply Restoration Act, which proposes to set aside Forest Service restrictions against the use of construction equipment during state-declared water emergencies. Flake and Nancy Sosa, the city’s archivist, were among the witnesses who testified Friday. “The unforeseen consequences of federal laws and regulations threaten to do something outlaws, economic busts, and the Arizona desert couldn’t: Kill the town too tough to die,” Flake said. Tombstone, population 1,400, is a throwback to the Old West and is famous for the 30-second gunfight at the O.K. Corral, which is re-enacted for tourists twice a day. “Without water, the most precious commodity in the desert, Tombstone will cease to exist,” Sosa said. She told the committee that Tombstone burned to the ground twice before the waterline was built. CNN will have more on this developing story Saturday. 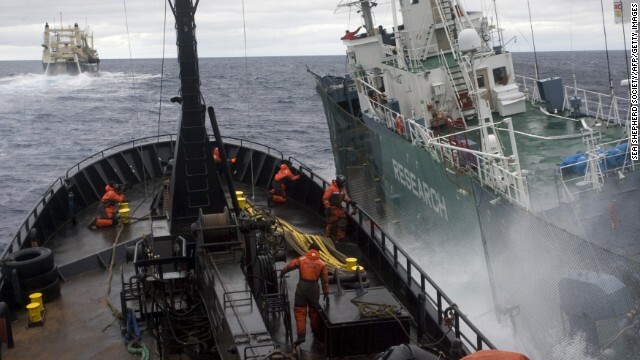 The Sea Shepherd ship Bob Barker clashes with Japanese whaling vessels this week in the Antarctic. Japan's whaling fleet was headed home from the southern ocean after ending its annual Antarctic hunt with only a third of its expected catch, news reports from Japan said Friday. The hunt ended three days ago with a catch of 266 minke whales and one fin whale, officials from Japan's Fisheries Agency said, according to one report from Australia's ABC news online. The Sea Shephed Society, which sent a fleet of vessels to the southern ocean to block the hunt, proclaimed victory on its website. "Operation Divine Wind is over! The Japanese whalers are going home!" the Sea Shepherd headline read. "There are hundreds of whales swimming free in the Southern Ocean Whale Sanctuary that would now be dead if we had not been down there for the last three months. 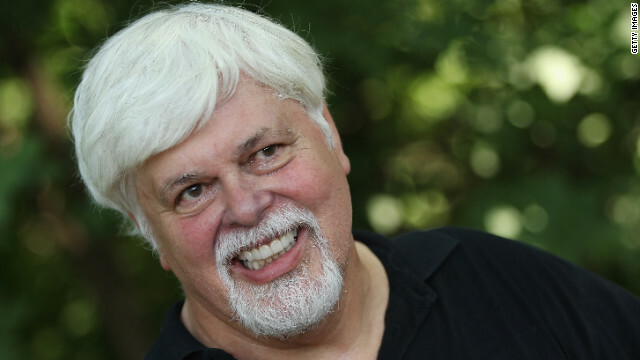 That makes us very happy indeed," Sea Shepherd's Paul Watson is quoted as saying on the organization's website. News of the Japanese whaling fleet's withdrawal comes four days after the Institute of Cetacean Research, which oversees the Japanese whaling program, reported a confrontation between the Japanese ships and Sea Shepherd's ship Bob Barker. The Bob Barker fired more than 40 flares and aimed a "high-powered" laser beam at the Japanese ships for more than 50 minutes, the institute said in a news release. Watson said that with the high-seas showdown, "the whaling season was effectively over for the season." Japan hunts whales every year despite a worldwide moratorium on whaling, utilizing a loophole in the law that allows for killing the mammals for scientific research. Sea Shepherd said it would be back to block the Japanese fleet if it returns this year. Author Dr. Seuss, or Theodor Seuss Geisel, sits with a copy of his book, 'The Cat in the Hat' in1957. 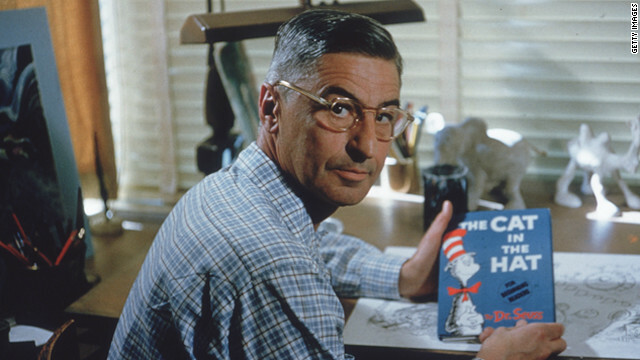 Dr.Seuss was born on March 2, 1904. He gave us stories like "The Lorax," "The Cat in the Hat" and much more. Theodor Seuss Geisel wrote books for all ages, with whimsical characters, rhyming and new phrases. Between a Grinch who stole Christmas, Sneetches and Thneeds, Dr. Seuss had an impact that all generations can see. So whether its "Green Eggs and Ham" or "Horton Hears a Who" we want to wish a very happy 108th birthday to you! TheTruffula trees come to life and roam free in this sneak peak of ‘The Lorax’ that’s playing in 3D. 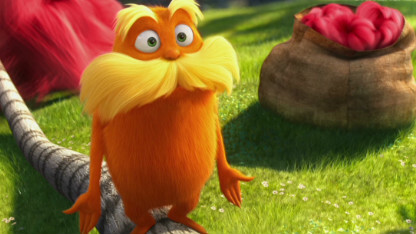 Truffula trees come to life and roam free in this sneak peak of ‘The Lorax’ that’s playing in 3D. With a cast like Zac Efron, Taylor Swift and Betty White to name a few, there’s no telling what this movie has in store for you. 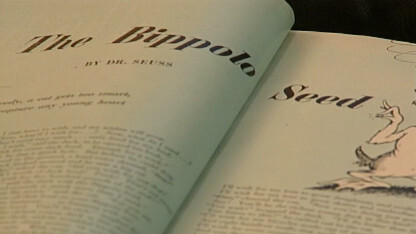 One man found a collection of Dr. Seuss stories that are new. It’s amazing what a bit of sleuthing can do. One man found a collection of Dr. Seuss stories that are new. It’s amazing what a bit of sleuthing can do. Just when you thought no more could be found, seven Seuss treasures collected and bound. In 2004 you didn’t have to look far. Dr. Seuss finally got his Hollywood star. In 2004 you didn’t have to look far. Dr. Seuss finally got his Hollywood star. Kids read from his books and his wife was there too. To honor the life and achievement of the man we once knew. You can also check out our education blog to learn about Read Across America Day, which takes place today. Lucy Lawless aboard the Noble Discoverer last week. 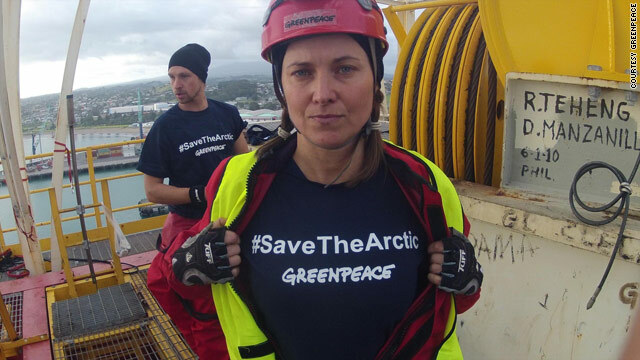 Actress Lucy Lawless, famous for starring in the television show "Xena: Warrior Princess," was arrested along with six other Greenpeace activists early Monday for boarding a drilling ship last week in New Zealand, according to Greenpeace. She and the others who were aboard the ship without permission were released shortly after their arrest, the activist organization said. CNN.com spoke with Lawless on Friday while she was having a restless night on the Noble Discoverer, a ship leased to Shell Oil. The ship was docked in the Port of Taranaki when the actress and other activists, on behalf of Greenpeace, made it on board to protest drilling in the Arctic. The group was able to display signs on the Discoverer's 174-foot drilling tower. One sign said "Stop Shell #SaveTheArctic." Lawless told CNN on Friday that she expected to be arrested for the stunt but that she and the others intended to remain on the ship for as long as possible. She stressed that exchanges between them and authorities had been peaceful. "We feel very much that what happens in the Arctic doesn't stay in the Arctic anymore," Lawless said. 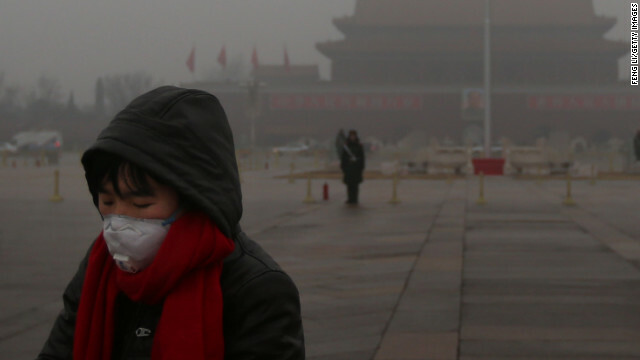 "An oil spill can never be cleaned up because of the remoteness and the freezing temperatures. We risk trashing whole ecosystems and poisoning them from plankton on up. It's absolutely unthinkable."